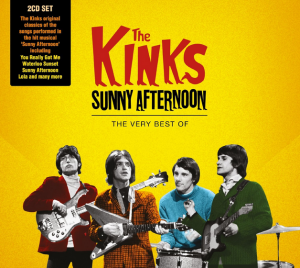 The original Kinks recordings of songs from the successful West End musical ‘Sunny Afternoon’ will be released on October, 16th. The album includes the hits ‘You Really Got Me’, ‘Waterloo Sunset’, ‘Sunny Afternoon’, ‘Dedicated Follower Of Fashion’, ‘Lola’, ‘All Day And All Of The Night’ and more. One of the most iconic and influential British bands of all-time, The Kinks release “Sunny Afternoon, The Very Best Of” – a must-have 2-disc retrospective – on the BMG label. The album features original versions of all the songs from the hit West End musical with added bonus tracks not included in the production plus some of Ray Davies’s personal picks he feels fit into the context of the release, including other Kinks hits and classics, BBC interviews and BBC session tracks. Along with a total of 9 UK top 5 hit singles including 3 Number 1s, the album, unlike other Kinks compilations, features tracks chosen by Ray that were not originally hits but over the years have become so due to TV shows, films and covers by other artists. Following a sold-out run at Hampstead Theatre, ‘Sunny Afternoon’ opened in the West End in 2014 and won 4 Oliver awards including Best New Musical, Best Actor In A Musical, Best Actor In A Supporting Role In A Musical, and Outstanding Achievement In Music for Ray Davies. From the very instant ‘You Really Got Me’ roared to Number 1 in 1964 The Kinks (along with The Beatles, The Rolling Stones and The Who) came to define a generation and confirm Britain as the rock ‘n’ roll centre of the world. With incomparable legendary frontman Ray Davies at the helm, brother Dave on lead guitar, Mick Avory on drums and Pete Quaife on bass, classic after classic followed ‘You Really Got Me’ into the charts, from ‘All Day And All Of The Night’ – which, along with its predecessor, is credited with helping to invent heavy metal and punk– to the risqué ‘Lola’, the pastoral ‘Tired Of Waiting’ and ‘Sunny Afternoon’, a chart topper when England won the World Cup in 1966. Their 1967 smash hit ‘Waterloo Sunset’ is widely considered to be among the greatest singles ever released – with Pete Townsend, Blur’s Damon Albarn and Paul Weller citing it as one of their everlasting favourites. The influence of The Kinks on generations of British and US music makers is incalculable, from glam rockers such as David Bowie, Mott The Hoople and Marc Bolan, to the new wave of Ian Dury, Madness, the punk of The Clash and The Pretenders (who had two top 40 hits with Kinks covers), to the heavy metal of Metallica and Van Halen to recent acts like Blur, Oasis, Mumford & Sons and Supergrass… the list goes on. The Kinks and Ray Davies in particular have been resurgent recently with not only the West End musical being phenomenally successful but also Ray closing the 2012 London Olympic games with a stunning rendition of ’Waterloo Sunset’, watched by nearly 1 billion people worldwide, and also releasing his autobiography ‘Americana: The Kinks, The Road and The Perfect Riff’.